Lahore : Guard Group booked berth in the Polo in Pink 2017 main final against Sherwood which will take place today (Saturday) here at the Lahore Polo Club ground. Black Horse Paints will vie against Total Nutrition in the subsidiary final. 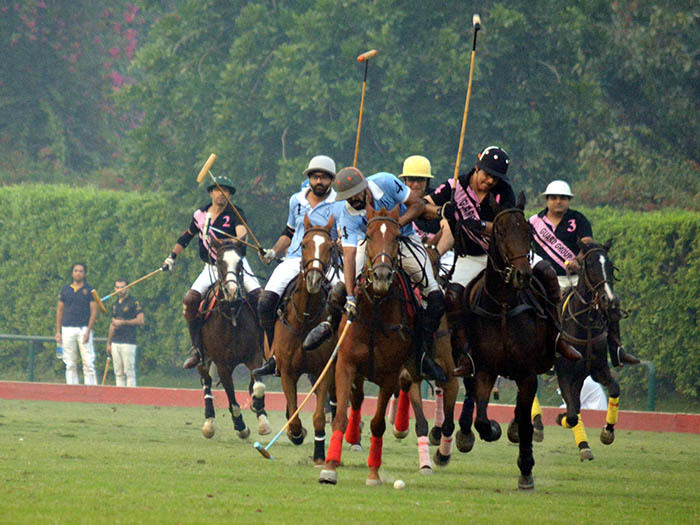 On the fourth day of the Shaukat Khanum Cancer Hospital-sponsored Polo in Pink event, as many as six matches were played and Guard Group and Black Horse Paints emerged as winners and qualified for the main final and subsidiary final respectively. In the first two-chukker match played under American system, Guard Group defeated Jalpana by 5-4½ with Mian Iftikhar Hussain scoring three and Taimur Ali Malik two goals and then they outlasted Qatalpur 3-1 to qualify for the main final. Earlier, Jalpana beat Qatalpur 3-2½. On the other hand, three teams also vied for the spot in subsidiary final and Black Horse won both of their matches to earn that place. Newage routed Diamond Paints 5-3 in the first match but Black Horse Paints then outpaced Newage 5-2 and Diamond Paints also with same margin of 5-2 to set subsidiary final clash against Total Nutrition.